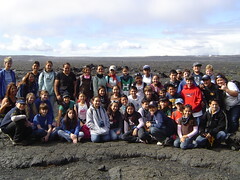 Kamehameha Schools 6th graders visited the Big Island of Hawai’i for their annual Huaka’i. We stayed at a camp site at the Volcanoes National Park. Here we are in the Kilauea Caldera following a three-mile hike across the crater. The students and teachers had a wonderful and memorable experience.